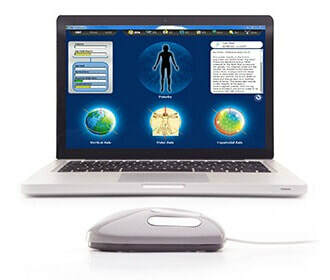 ​The NES BioEnergetiX WellNES System is a proprietary computer software that provides a way to peek into the bioenergetic and informational recesses of your body-field to see what is going on. It’s a snapshot that allows you to accurately assess the correlations between your body-field and your physical and emotional states at a particular moment in time. The scan itself is quick, easy, and noninvasive. You simply place your hand on the scanning device, which looks like a large computer mouse, and the software in the computer reads your body-field. The scan is essentially a quantum electrodynamic (QED) matching test that scans for something nothing else is able to reliably detect---the waveforms of the body-field and the interference patterns that impart information. Basically, the computer on which the NES analysis software is loaded sets up its own QED field. You have to have an electrostatic field to create the QED field and get information exchange, and the hardware of the computer creates a weak one that is sufficient to conjugate the body-field. Your body-field and the QED field from the computer become entangled, and through a proprietary process, the scanning software is able to assess where matches are made between your body-field and the template of the body-field structures that is encoded into the software. While the entanglement of the two QED fields allows the information to flow and thus be detected, the matching is of the structures in space whose qualities impart that information. The NES system is, in effect, asking questions of your body-field and sensing information about the changes in space that are interpreted as responses from your body-field. Unlike allopathic medicine, where tests seek to determine baseline measures, such as your liver enzyme level, and then determine if there is a problem if your liver enzymes fall outside of what are considered normal parameters, the NES system is sensing the quality of response it gets back. It senses how strong or weak the match is and then prioritizes the responses it gets and returns them graphically for the practitioner to assess. The NES system is not a biofeedback type of system, which, depending on the type of system, detects changes in the electrical characteristics of the skin or brain. The interaction that takes place during a NES scan between the computer and your body-field is a quantum process and it happens almost instantly. Although each person has a somewhat unique biochemistry, our body-fields are all structurally the same and that body-field structure is crucial to the proper functioning of everything that goes on in the body. It is not necessary, as it is in allopathic medicine, to get a reading of every item within a system, such as blood gases, cholesterol level, potassium level, and so forth. Instead, we look at the state of the larger energetic and informational structures themselves. By correcting distorted structures, everything within those structures is affected. So, you could say that the NES scan is analyzing the "functional integrity" of your body-field. By functional integrity, we mean that the objective of the scan is similar to identifying the weakest links in a chain because your body-field is only as strong as its weakest aspects. A NES scan identifies those weaknesses, and the NES Infoceuticals can be used to correct them. From a physics perspective, you could say that the moment you place your hand on the scanning device and hit the scan button, the computer is probing the wavefunction of your body-field and turning what was virtual into something very real, or measurable. The result is an informational snapshot of your body-field. To understand what this informational snapshot is all about, you have to know about certain other aspects of your body-field. For instance, your body-field is dynamic, which means it is always changing. Your body-field is a holographical structure that records everything that happens to you and everything to which you are exposed. As you can imagine, in any given second, millions of things are impacting you: your emotions and state of mind, people around you, electromagnetic fields, light, heat or cold, toxins and pathogens, the food you have eaten and liquid you have drunk, and on and on. The NES analysis is a snapshot at one moment in time of the functional integrity of your body-field as it works to mediate all the influences on it and translate those influenced into information the body can use. As long as you are alive, your body-field is in constant interchange with the environment and subject to the influence of your own beliefs, thoughts, emotions, memories and more. So, distortions are inevitable. The number of matches made in a single scan is about 145, and the information is correlated, sorted and prioritized before being return graphically in the analysis reports that show up on the practitioner’s computer screen. By sensing the quality of the matches between your actual body-field and the information about the body-field and its structures mathematically encoded in the NES software, the computer can detect where and to what degree your body-field is distorted. These distortions are prioritized according to the body’s preferred sequence of healing, in other words, by which distortions the body-field is indicating are best corrected first to support the body’s own self-healing capabilities since it is, in fact, the body's own self-healing capacities that ultimately restore the body to a healthy homeostasis. Ultimately, multiple NES scans over time determine the body-field’s correlation to the root causes of physical and emotional problems by working through the many layers of the holographic body-field to reveal the preferred sequence for healing. We do not address symptoms, which is what most allopathic diagnoses are based on. We do not diagnose, treat, prevent or cure disease. We are working at the holistic, systems level of your body-field with energy and information, not physical tissue or cellular processes directly. Although many people come to NES to address the bioenergetic aspects of specific physical or emotional problems, NES is actually ideal for use as part of an ongoing wellness program because it can identify potential problems at the bioenergetic level before they manifest as symptoms of disease in the body.